After peeling the rind from the lemon, place the pieces of lemon peel and the 1 1/4 cups sugar into the processor or blender. Blend together with metal chopping blade until the peel has been finely chopped and mixed well with the sugar. Sugar will turn a yellowish hue. No food processor? No worries! Grating the lemon rind by hand is just fine! Blend together: the 1 cup softened butter, 1/2 cup powdered sugar, and the 2 cups flour. Press evenly into ungreased 9 x 13 inch pan. Combine: the eggs, lemon peel, 1 1/4 cups sugar (or the lemon-sugar mixture), lemon juice, and the 1/4 cup flour. Blend well. When crust is golden brown, pour filling over top of baked crust. bake 25 minutes or until firm to the touch. Allow to cool. 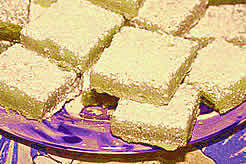 Sprinkle with powdered sugar and cut into bars. Makes 24 lemon bars. Always wash the surface of the lemons (or any fruit/veggie) before cutting! After washing and drying 2 fresh lemons, peel the rind away with a knife or vegetable peeler, being careful NOT TO INCLUDE the white part beneath the peel, since that part has a bitter taste! You only want the peel closest to the surface! A food processor really helps in this recipe! It makes the lemon rind so fine, that it's almost imperceptible in the finished product! AND it makes a snap out of preparing the crust, too! *Click button for PRINTER friendly version. This recipe is brought to by www.deenavision.com. Contact me to have your own website custom crafted. Free Consultation & Quotes. No job too small!